Keith Getty and his wife, Kristyn, along with their band, just completed their 18-city “Joy: An Irish Christmas” tour. They played in Asheville, N.C., where WORLD News Group calls home. An appreciative audience of more than 1,000 people showed up for the concert, and beforehand I sat down with Keith to talk about his life and his music. Is it true that you started as a flute player and that the famous flautist James Galway discovered you? I played the flute, and I did a couple of arrangements for him. I’m not even sure if he played them, but, still, it was a nice thing for him to ask for me to do. Either way, it helped me understand music. I was a classical musician, an instrumentalist and a conductor. But every time I tried to knock the door down as an instrumentalist or a conductor, I ended up being asked to be the arranger. And from becoming a musical arranger, I ended up a songwriter. You did a lot in the non-Christian world: television commercials and such. I just did music whenever music came around. So I did get to work for television and movies. But I married Kristyn and I turned 30 six months later. That was a real defining point in my life. At that point, I quit everything to focus on being a hymn writer and being a steward of those hymns. What’s the difference between being a songwriter and a hymn writer? There’s no scientific difference in the two, but I tend to align myself with historical hymn writers of the Christian church. I try to follow those traditions. I’m a child of the 21st century, and I encourage organically written music in churches. I use modern worship music. But I do feel there needs to be a voice which explains some of the more traditional values of hymn writing, of textual richness and depth, of a congregationally central music which all generations can sing. Those values are much more aligned to historic hymn writing than to modern worship music. 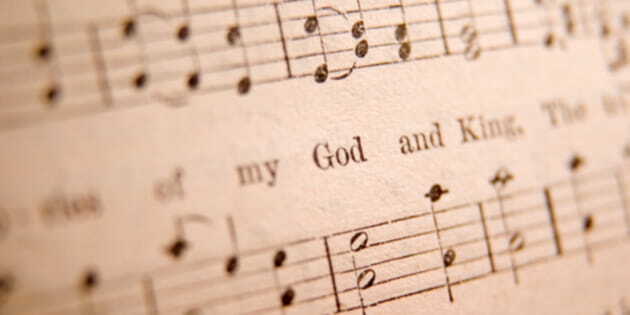 I’m a hymn writer and a steward of the hymns God has given me and the values God has given me. I didn’t create a modern hymn movement. I didn’t buy modern-hymn-movement-dot-com. We don’t make T-shirts, although that would be very profitable. But it wouldn’t help develop the songs. We don’t have our own line of crockery, because it doesn’t help churches sing the songs. CDs and songbooks do help. Touring and doing events, coupled with lunchtime lectures I do for pastors, I think helps develop the values and helps also wider kingdom goals. Famous secular musicians such as Moya Brennan, Ricky Skaggs, and Alison Krauss sing on your most recent album. How did you come to work with them? Moya had me as an arranger many years before on one of her projects. Then she had become a believer, and we got back in touch. I then asked her if she’d sing on the record. Ricky Skaggs came to one of our concerts, last Christmas, and we became friends. He asked us to be his guests on his 30th anniversary at the Grand Ole Opry. He wanted Alison Krauss and Kristyn to finish the night singing “In Christ Alone” with him at the Opry, which was a great memory. So that was a special night. Alison Krauss sang “In Christ Alone” at a friend’s funeral. We marked the 10th anniversary [of “In Christ Alone”] by redoing it with Alison. The album had so much Irish-bluegrass crossover, it was just a lovely little touch. Your songs certainly lend themselves to fantastic individual performances, but you seem more interested in congregational singing. I’m complimented by [the individual performances], but these songs are primarily congregational. If people do great individual performances—whether my wife or whomever—that’s great, and that ironically helps them become more popular congregationally, but they’re primarily written for congregations. The artist I write for is not my wife. The artist I write for is the congregation. So are you hopeful about the future, both the future of Christian music and the future of the church? Oh yeah, of course I’m hopeful about the future. I think we live in the most exciting generation to be a Christian. But I think there are huge challenges. Of course, the question of hopefulness rests on hope in Christ. (c) WORLD News Service. Used with permission.